Curacao is an autonomous country within the Kingdom of the Netherlands. It is located in the Caribbean near Venezuela. It is a tropical paradise that is known to rarely be disrupted by tropical storms, which is why many people go there every year. One of the things you will like in Curacao is the culture. By the looks of it, you would say that someone moved a Dutch city in the Caribbean. The buildings are designed in the Dutch style, and they are painted in beautiful pastel colors. Other than that, you can enjoy the many beaches and water sports. You can go diving and snorkeling, and if you are curious, you can visit the Curacao ostrich farm and game farm. Before you take a trip to Curacao, you need to see if you need a visa or not. Even if Curacao is a part of the Kingdom of the Netherlands, a Schengen visa is of no use, which is why you need to get a visa for Curacao specifically. Applications are typically submitted to the diplomatic mission of the Netherlands, and a visa that grants a 30-day stay is released. Nevertheless, according to the visa policy of the Kingdom of the Netherlands in the Caribbean, many nationalities can travel to Curacao without a visa if their stay does not exceed 90 days. 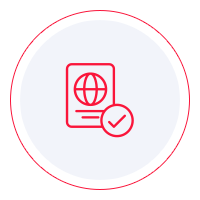 To see if you need a visa or not, you can check out the visa policy of the Kingdom of the Netherlands in the Caribbean and look for your country of origin on the list of visa-exempt states. However, using iVisa’s Visa Checker will make the task easier. All you have to do is click on the Visa Checker button you see in the top right corner and fill in the boxes. You must select your nationality from the drag-down menu on the left, and on the right, you must choose Curacao as your destination. The result will tell you if you need a visa or not, and if you do, you will be given some useful information such as a list of the nearest embassies where you can apply. Unfortunately, iVisa does not process applications for Curacao since electronic visas are not available. Even so, we still want to help you in any way that we are able, which is why our support service is at your disposal 24/7 and is free of charge. At the same time, you need to check out the visa requirements to make sure that you meet them. You can find a lot of information online, but we advise you to use it as a reference only. The info you see online is not always the most reliable. In consequence, we recommend that you call the issuing authority and ask your questions there. They can give you the most legitimate answers. Meanwhile, what we can tell you is that all travelers who take a trip to Curacao need to have a passport that does not expire for at least another 6 months from the date of arrival. Even though we cannot provide further assistance with the process of obtaining a visa for Curacao, we hope that the information above is somewhat helpful and points you in the right direction.